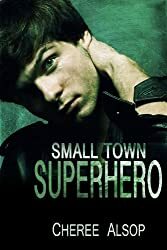 Small Town Superhero is the story of young Kelson Brady as he moves to the small town of Sparrow and is confronted with bullies. Kelson thought he’d never recover from his sister’s death. He thinks it’s his fault. So when his mother sent him away to live with his aunt and uncle, he thinks its about what he deserved. But even heartbroken, Kelson can’t stand by and watch the Bullets, Sparrow’s homegrown gang, bully other students and grownups alike. But he can’t fight back, not at the risk of his family. So he creates the Black Rider, a black-clad motorcyclist vigilante fighting for the freedom of Sparrow’s inhabitants. Kelson is broken inside from his sister’s death, but he finds healing in bringing justice to the weak and in a certain neighbor girl who is one of the few to find out the secret identity. The Black Rider gives Kelson a chance to atone for his sister’s death and the part he played in it. But it also gives him a chance to find the hero in himself, and all boys need a hero. If you like the sound of Kelson’s story, check out the rest of the Small Town Superhero books here or on Author Cheree Alsop’s website.